Welcome to the Endurance Nation Race Strategy page for Ironman® Chattanooga! Our goal here is to get you 100% up to speed and ready to have your best race possible. Every single race is unique, and Ironman® Chattanooga is no exception. 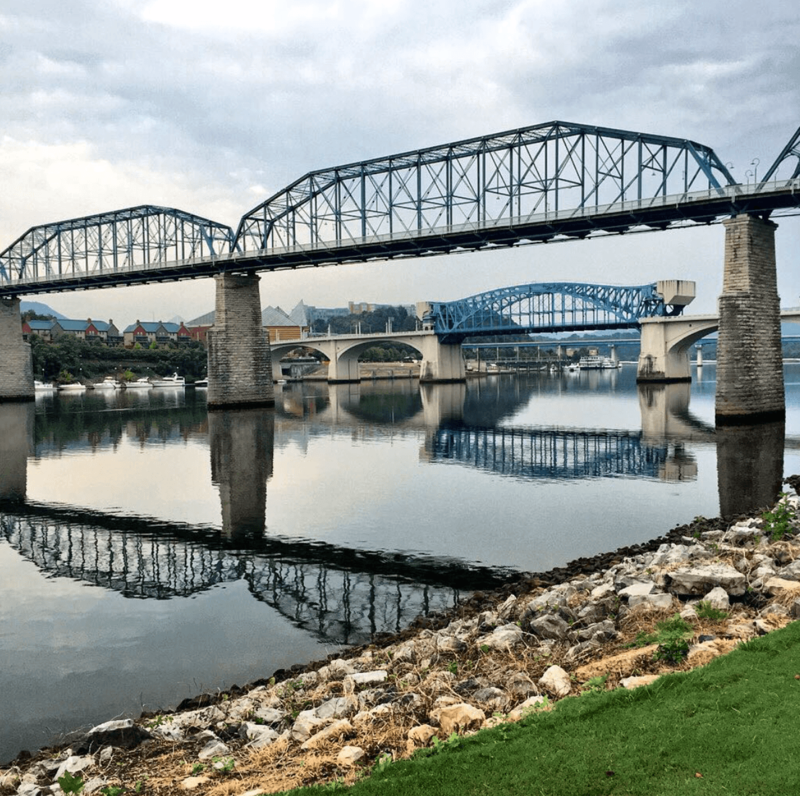 The swim is generally beginner friendly, the bike course is “sneaky hard,” and the hills across the river in the final miles of the run will make sure you don’t forget your Chattanooga experience! IMChoo is an Endurance Nation favorite, with over 40 TeamEN athletes competing each year of the event. Don’t have time time to dive into a full review of the course? Then cover the most important highlights in this short video with Coach Rich from Endurance Nation. Though the average temperatures in Chattanooga for late September are generally mild, after the record heat of 2016 we highly recommend you come prepared to race on a hot day. The Bike: the bike course is “sneaky hard,” as Coach Rich will explain in his bike course overview video below, and we recommend you display percent grade on your bike computer, if that’s available to you. We recommend a triathlon bike with all of your aero wizardry applied: front race wheel, rear disk (or wheelcover), aero helmet, race tires, smart bottle and equipment placement, etc. For gearing, we nearly always recommend a compact crank (50/34) or “super compact” (52/36) if you’re a bit of a stronger rider on an 11 speed bike. Everyone should have at least a 26t cog on their cassette (for example, a 26-11 for stronger riders), with less strong riders always benefiting from a 28t or higher (for example, a 28-12 cassette). The Run: You will want to choose the gear that will give you the flexibility to handle the heat, if a hot day is in the cards. It will need to have pockets for carrying nutrition, and plenty of zippers so you can reduce any accumulated heat. A hat is recommended, of visor at a minimum. If you aren’t carrying your own fluids with you, then plan on transporting salt at a minimum so you can keep your gut happy. Plan on a race number belt with pockets to carry salt / fuel. You can access your Run Special Needs bag only at the beginning of the second loop. The Ironman® Chattanooga is a point to point course, with athletes taking a shuttle race morning from the transition to the swim start. Once there, seeding is first come, first served, so just get in line and jump in the water when it’s your turn. The first year of the event featured a very fast, down river swim but since then the Tennessee Valley Authority, responsible for controlling the water flow in the river, has apparently worked with the race to make it a bit less downhill. Still, this is generally a friendly swim for beginner Ironman athletes. Point to point swim, with shuttles transporting you from the transition to the swim start. The operation is very efficient so no need to go crazy and get on a very, very bus. Self-seeded, first come, first served swim start. The Ironman® Chattanooga bike course takes you out of Chattanooga into the North Georgia on some rough, admin roads. From there you’ll head south on a 4 lane highway before dropping into the countryside for a very scenic ride. After riding through Chickimagua you’ll repeat the loop again before heading back to T2 in Chattanooga. At 116 vs 112 miles, you get more than you paid for…so there is that! The key terrain on the course is the fact that the first 33 miles, especially miles 20-33, are generally uphill, with this later section on a very difficult to identify false flat. This false flat sets up everyone to ride too hard in the first 33 miles, and pay for it dearly on the admin ride back to town and then on the run. Ride very, very easy until the Dollar General store at about mile 20. From there, be very aware of the false flats until you make the hard left on Hog Jowl Road. Just execute the terrain in front of you in a manner that sets up the run. Ride smart through your second trip through Chickamauga so you can have a confidence-filled ride back to Chattanooga. 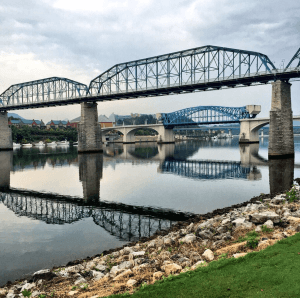 The Ironman® Chattanooga run course is two loops and most notably includes some very beefy hills on the ride of the river, at about miles 8 through 11 on the first loop, and miles 20-23 on the second loop. Your success or failure in these hills, especially on the second loop, should be your main focus all day! We recommend you give yourself 6 miles of easy running to settle in, getting a head start on your nutrition and hydration. From there, run comfortably, getting what you need at the aid stations and preparing yourself mentally to dig deep after mile 18, and in particular on Barton (up hill, both ways!) on the other side of the river. Be prepared a crowded bike path as you run back towards transition on the middle of the 1st and 2nd loops. Steel yourself to succeed on the hills across the river, on both loops!